Home / SkinCare / The Rose Tree Soothing Bath & Shower Oil with Geranium, Cypress & Lavender. The Rose Tree Soothing Bath & Shower Oil with Geranium, Cypress & Lavender. The Rose Tree offer a luxury skincare and body care range. Each product embodies luxury at the highest quality whilst being made from mother earths most effective organic flowers and plant essences. The Rose Tree mantra is believing in your ageless beauty by helping you and your skin be radiant, hydrated and glowing. Every ingredient is honestly listed, whilst also being ethically sourced, their skincare is stunningly effective using the best and most powerful natural and therapeutic ingredients. The Rose Tree Soothing Bath & Shower Oil with Geranium, Cypress & Lavender is a multitasking treatment just waiting to be used. Situated in a high-end luxury bottle, the oil is a soothing remedy for an overworked mind and for dry thirsty skin. Beautifully indulgent, contains enough for approximately 16 baths/showers. Now with even more pure essential oils to give an amazing 100% natural scent. SLS/SLES free, Suitable for all skin types, Vegan friendly, Gluten free. Organic Apricot Oil helps skin to maintain moisture balance whilst containing A & Vitamin E to soothe skin and slow signs of ageing. Safflower Oil is less aggravating to skin and contains linoleic acid, a secret weapon against acne problematic skin. Preventing dryness and roughness, thanks to its hydrating properties, its an excellent treatment for eczema and psoriasis sufferers. Ylang Ylang flower oil is well known for its sweet floral scent and is one of the key ingredients in Chanel No.5. The scent harnesses powers to positively impact your mood whilst also preventing skin irritation and ageing. Geranium leaf oil has antiseptic properties that can treat a variety of skin problems such as eczema, fungal infections and can speed up skin healing. Sunflower seed oil is high in essential fatty acids which help to tighten and firm skin whilst promoting a smooth and soft appearance. 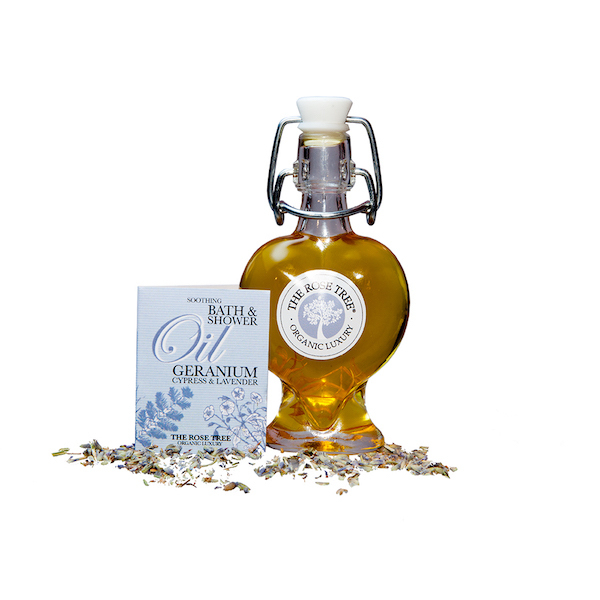 Sunflower seed oil is highly recommended for sensitive skin types. Cypress leaf oil is known for its antiseptic and antibacterial properties but also has a calming, relaxing effect on both mind and body. Marigold flower extract is a highly effective moisturiser for dry and chapped skin, helping to soothe any area and soothe irritation. Vitamin E helps to regenerate new skin cells promoting healthy skin and reverses signs of ageing. Restoring lost moisture it is ideal for dry and damaged skin. Ingredients Listed In The Rose Tree Soothing Bath & Shower Oil. 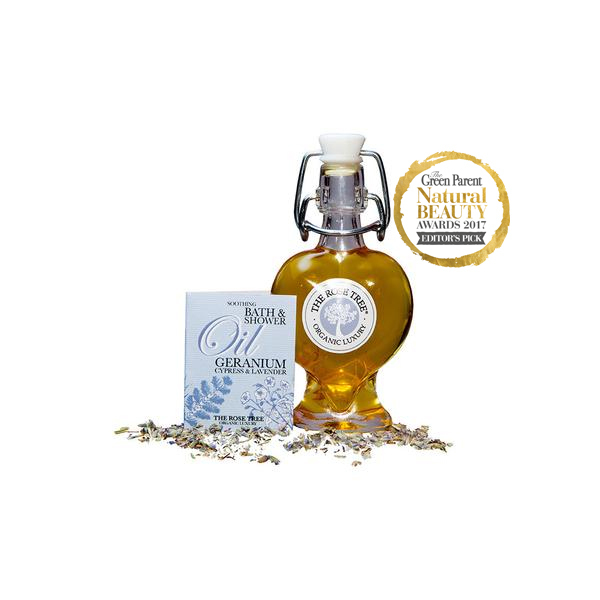 Carthamus tinctorius seed oil, Prunus armeniaca kernel oil, Pelargonium graveolens leaf oil, Helianthus annuus seed oil, Citrus grandis peel oil, Juniperus communis fruit oil, Pogostemon cablin leaf oil, Calendula officinalis flower extract, Tocopherol, Calendula officinalis flower. Natural constituents of essential oils: Citronellol, Geraniol, Linalol, Citral, d-Limonene. Shutting the bathroom door is important, before drizzling the rose tree oil under running water in your bath, to experience the mood lifting fragrance at its full potential. 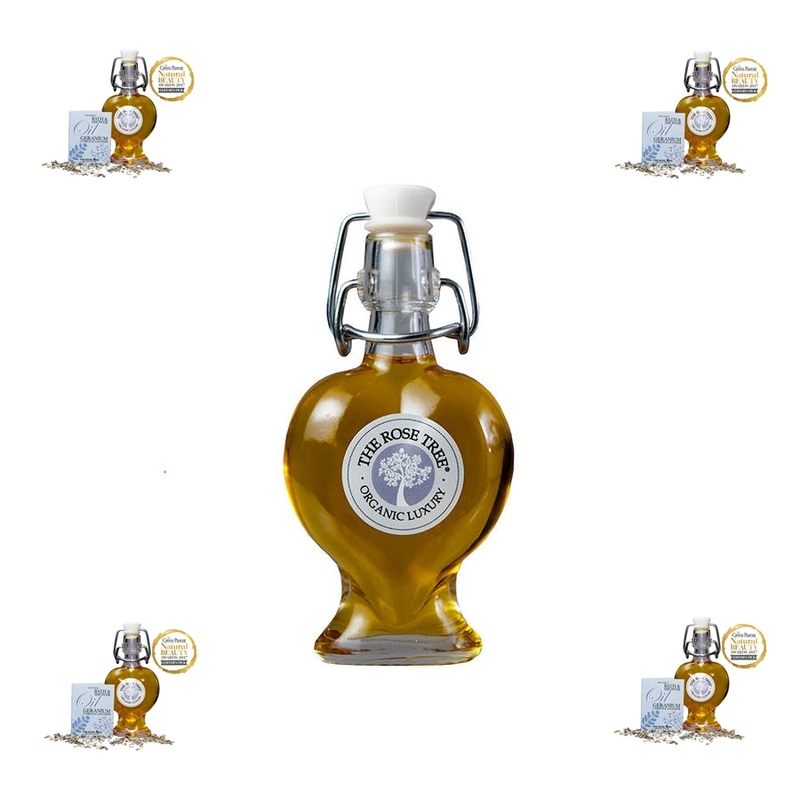 You can experience the same benefits if you are showering by applying a small amount of the luxury oil to your body, before turning the shower on. The fragrance is a delight to the senses as it opens with a sweet citrus that calms down to a heavenly lavender. Skin is instantly moisturised and pampered, whilst still feeling cleansed and your mood is instantly brightened. I did notice when drying off that skin is perfectly hydrated without feeling overly greasy. Just be careful getting out of the bath as the oil can leave the bath tub a bit slippery, non-slip bath mats are a great method to combat this. 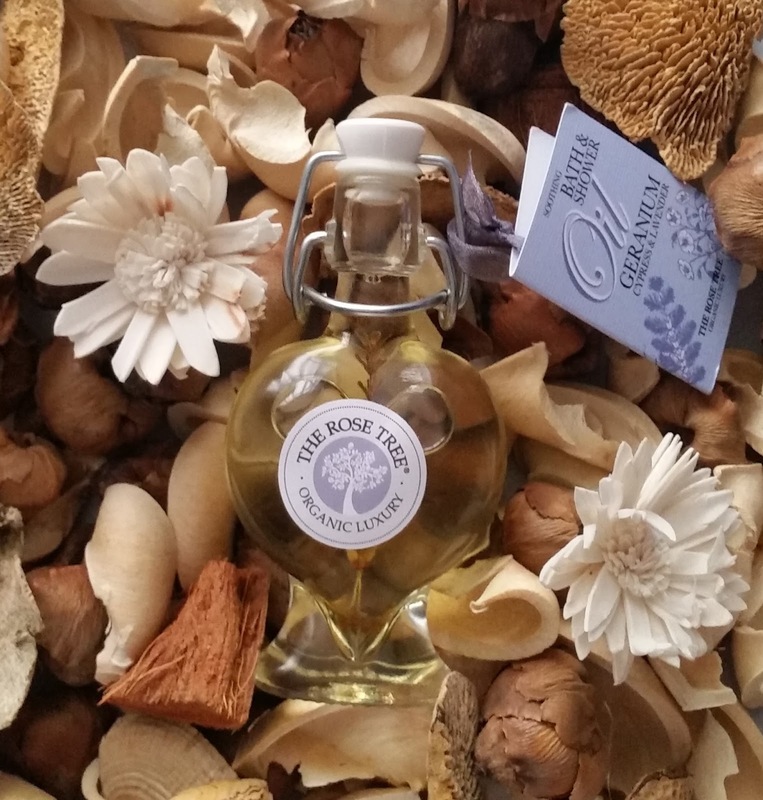 The Rose Tree only use the highest quality pure plant oils and all essential oils are used within safe limits. However if you are pregnant or nursing it is recommend you check with your doctor before using any products containing essential oils. For external use only. Keep out of reach of children. IF IN EYES: Rinse cautiously with water for several minutes. Remove contact lenses, if present and easy to do. Continue rinsing. If eye irritation persists, seek medical advice/attention. I was really impressed on how the the rose tree oil can transform skin within one use to perfectly balanced hydrated skin whilst also comforting your spirit and easing your mind. A luxury award winning skin oil treatment at home that you deserve, treat yourself by heading over to ManOrganic to purchase The Rose Tree Soothing Bath & Shower Oil with Geranium, Cypress & Lavender. X Neil.